Once August is over, many of us festival goers feel a strong sense of post-festival blues. But have no fear – Southsea Fest is here! I realise how cringey that sounds but seriously, Southsea this year looks epic. We always rave on about finding the best new bands and artists that are destined for great things so it’s no wonder that here at Raw Meat, we are excited about Southsea. It’s all about promoting all the best new acts; whether it be rock, indie, alternative, folk or pop; you name it, Southsea has got it. 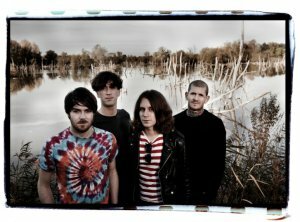 Pulled Apart By Horses have recently been announced at the top of the bill for Southsea this year, and rightfully deserved. This band have gigged and toured continually since they first started out back in 2008 and have got bigger and bigger each year. This year see’s the release of the bands more than promising third album, Blood, just weeks before Southsea. With that in mind, and the phenomenal live performance that is guaranteed from every Pulled Apart By Horses set and the fact that this band are HEADLINING Southsea – you’d be crazy not to get your mosh on. Joining Pulled Apart By Horses in bringing you the best honest rock out there is Dinosaur Pile Up. Their success has been simmering for a while now but after spending most of their time this year over in America, Dinosaur Pile Up are sure to have some new tricks up their sleeve. Be prepared for some upbeat, fuzzy and grunge sounds blaring through their sound system. If you fancy something a bit lighter, then Ed Harcourt is headlining the Kings Theatre. The singer/ songwriter is sure to get your spine tingling and eyes pricking with tears with his profound, heartfelt tones. And as if that wasn’t enough; DZ Deathrays, Flyte, Laurel and Eliza and the Bear are amongst some the better known acts hitting Southsea this year. But it’s not all about these ‘well-known’ acts. Southsea is all about discovering your new favourite band just by chance because you got the times mixed up and ended up seeing someone you’d never heard of before. Unlike the major festivals, Southsea isn’t about getting to the venue or tent an hour early just so you can get a good spot for a band that’s on for half an hour: Southsea wants you to enjoy and make the most of your time at the festival through finding the best new talent.